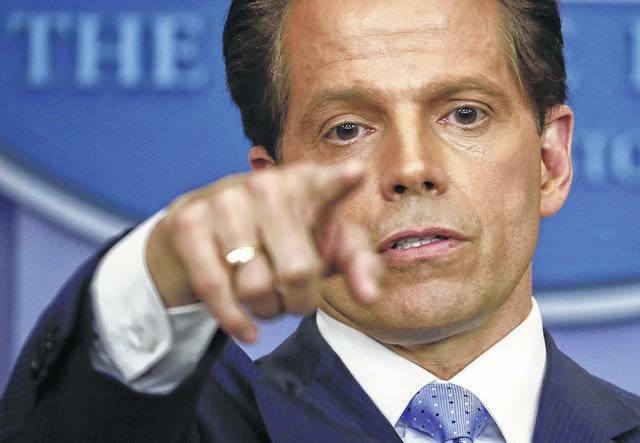 Incoming White House communications director Anthony Scaramucci points as he answers questions from members of the media during the press briefing in the Brady Press Briefing room of the White House in Washington, Friday, July 21, 2017. NEW YORK (AP) — He was the only Trump ally on stage that day. Yet Anthony Scaramucci didn’t seem to mind the tough questions from MSNBC host Joe Scarborough or the hostile crowd that filled the luxury hotel ballroom at last month’s private gathering of Mitt Romney supporters. Scaramucci drew from his working-class New York roots to explain Trump’s appeal. Scaramucci formally became Trump’s new communication’s chief on Friday. The man known on Wall Street as “the Mooch” is now tasked with crafting the president’s communications strategy amid escalating political crises and sinking popularity. But for all his passionate defense of Trump in recent months, Scaramucci becomes one of the least experienced White House communications directors in recent memory. Trump press secretary Sean Spicer quit in response to the hiring, objecting to what he considered Scaramucci’s lack of qualifications as well as the direction of the press operation, according to people familiar with the situation. Scaramucci joins the White House directly from a job on Wall Street, where he made a name for himself as a hedge fund manager who enjoyed appearing on television — and rubbing elbows with celebrities like Trump — as he emerged as a prominent Republican donor. Those who know him describe Scaramucci as less a political operative than a quick-thinking New York operator who rewards friends with perks like performance tickets. He ended his first appearance at the White House briefing room podium Friday with a blown kiss to the assembled press. “He has the New York style, the New York pace that the president likes and is used to,” said former Trump aide Barry Bennett. Scaramucci grew up on Long Island in the shadow of New York City. In a recent interview, he said that neither one of his parents went to college. He shoveled snow and delivered newspapers as a child to make money. He would go on to graduate from Harvard Law School before heading to Wall Street. Scaramucci worked for Lehman Brothers and Goldman Sachs and ultimately founded his own firm, SkyBridge Capital, which managed more than $11 billion when it went up for sale late last year. The firm also hosted a conference each year in Las Vegas that attracted financial leaders and celebrities like basketball legend Magic Johnson and the singer Jewel. Scaramucci joins the Trump administration before he’s fully divested from the firm. “It’s currently going through customary closing conditions and regulatory approval,” SkyBridge spokesman Rich Myers said of the firm’s sale. He expects final approval before the end of the summer. Scaramucci’s path on Wall Street led him to a friendship with Trump years ago. Both were once Democrats. Scaramucci helped raise money for President Barack Obama before souring on the Democratic president’s treatment of Wall Street. Once he became a Republican, however, he was slow to support Trump. Scaramucci first served as a fundraising chairman for Wisconsin Gov. Scott Walker’s short-lived campaign before moving on to former Florida Gov. Jeb Bush’s bid. He joined Trump’s campaign only after Bush dropped out of the race. Walker’s former campaign manager Rick Wiley recalled Scaramucci’s profound loyalty during the campaign after reports surfaced that Trump was trying to steal him away. The sharp-tongued Scaramucci was a vocal Trump critic at that time, however. And he had the platform as a regular guest on cable news to ensure his opinion was well-known. He called Trump “another hack politician” who was “probably going to make Elizabeth Warren his vice presidential nominee,” while hosting “Wall Street Week” on Fox Business in 2015. “You are an inherited-money dude from Queens County — bring it, Donald,” Scaramucci said at the time. He ultimately joined Trump’s team once it became clear the New York businessman would become the nominee. And in the closing months of the campaign, he developed a close friendship with Trump’s son-in-law, Jared Kushner. In that process, he grew closer to Trump, who is said to be a fan of Scaramucci’s television appearances. Given his lack of experience, however, it’s unclear how he plans to manage the president’s communications strategy. He said Friday that he discussed the path forward with Trump earlier in the day. “We were talking about letting him be himself, letting himself express his full identify. I think he’s got some of the best political instincts in the world and perhaps in history,” Scaramucci said of the president.